ArtBOX is a Creative Arts Management office dedicated to conceiving and implementing contemporary art projects, founded in 1999. Since our first steps 15 years ago (1999-2014), we have organised more than 185 projects, exhibitions, conferences, festivals and other contemporary art events. More than 90% of our activities are collaborations with institutions outside Greece, while 30% has been realised abroad, in 33 different cities (New York, London, Berlin, Istanbul, Venice, Spain, the Middle East and elsewhere). We have been involved, as artistic directors and project managers, in all of the most significant contemporary art events and institutions in the country, among others: Art Arthina - international art fair (2005-2008), Action Field Kodra - annual visual arts festival (2004-2008), Forum European Cultural Exchanges (2000-2010), the Macedonian Museum of Contemporary Art (2010- 2012), and the Young Artists Biennale of Europe and the Mediterranean (2011), ARETCITYA by Goethe Institut Thessakoniki (2014 - 2019). In 2009, we were invited by the then Director of the Venice Biennale, Daniel Birnbaum, to create and co-curate a project in the framework of his exhibition at the Venice Biennale. 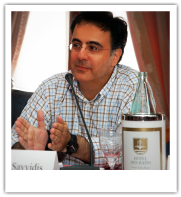 Christos Savvidis is the founding director. Lydia Chatziiakovou collaborates as co-director on a permanent basis since 2004. Dr. Sotirios Bahtsetzis has been our scientific advisor for the past few years. Founding director of ArtBOX.gr | Creative Arts Management, Christos Savvidis has been the Artistic Director of large-scale events such as: Art Athina - Athens international art fair (2006-2008); Action Field Kodra visual arts festival (2004-2008); XV Biennale de la Mediterannee in Thessaloniki (artistic direction and organization, 2011). He has organized and coordinated projects, such as: Forum European Cultural Exchanges (founding member and coordinator, 2000-2009); Greek Pavilion in the Venice Biennale (coordination, 2001 and 2006); exhibition "Roaming Images" in the framework of the 3rd Thessaloniki Biennale of Contemporary Art (project leader, 2011); ARETCITYA by Goethe Institut Thessakoniki (2014 - 2019). He has also curated projects and exhibitions, such as: "Moscow Poetry Club / Making Words", within the framework of the international art exhibition of the 53rd Venice Biennale "Making Worlds" (co-curator and co-organizer, 2009); and the Greek participations in BIDA - International Biennial of Sports in Contemporary Art, Spain (curator and coordination, 2005 and 2007). "Europe Exists" curated by Harald Szeemann and Rosa Martinez (assistant curator, 2003). Between 2010 and 2012, Co-Director of Arts Management of the Macedonian Museum of Contemporary Art (Thessaloniki, Athens), and Artistic Director of the Museum's Project Space with Lydia Chatziiakovou. Christos Savvidis is member of IKT (International Association of Curators of Contemporary Art) and AICA (International Art Critics Association). ﻿Permanent collaborator of ArtBOX.gr | Creative Arts Management (since 2004), she has coordinated and curated exhibitions and projects in Greece and abroad, among which: XV Biennale de la Mediterannee in Thessaloniki (artistic coordinator, catalogue editor, 2011); Roaming Images in the framework of the 3rd Thessaloniki Biennale of Contemporary Art (artistic coordinator, catalogue editor, 2011); Moscow Poetry Club / Making Words, within the framework of the international art exhibition of the 53rd Venice Biennale "Making Worlds" (co-curator and coordinator, 2009); Art Athina - Athens international art fair (co-curator, coordinator of the parallel program, catalogue editor, 2006-2008); Action Field Kodra visual arts festival (co-curator, coordinator, catalogue editor, 2004-2008). Between 2010 and 2012, she was Co-Director of Arts Management of the Macedonian Museum of Contemporary Art (Thessaloniki, Athens), and Artistic Director of the Museum's Project Space (with Christos Savvidis). 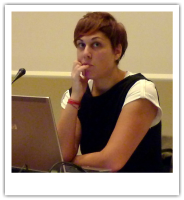 She is also a member of the programming team of the non-profit organization Margaris Foundation (http://margarisfoundation.blogspot.gr, Thessaloniki and Amfilochia, Greece) and a co-founder (with Stephanie Bertrand) of the group Société Anonyme (www.societeanonyme.gr). She has written texts for catalogues on various occasions and she is the editor of exhibition catalogues and publications. Member of IKT (International Association of Curators of Contemporary Art) and AICA (International Art Critics Association). Sotirios Bahtsetzis is a writer, curator and educator based in Athens and Berlin. He holds a PhD on Art History (Technical University of Berlin: Geschichte der Installation. Situative Erfahrungsgestaltung in der Kunst der Moderne). He is an adjunct professor in history of art at the European Studies Program of the Hellenic Open University. In 2009 he was a Fulbright Research Scholar at the Columbia University, N.Y. (U.S.A.) Between 2006 and 2011 he taught history and theory of modern and contemporary art at the Architecture Department of Patras University and the Architecture Department of the University of Thessalia (Greece). Between 2002 and 2004 he taught history of culture and visual culture in the Sir John Cass Department of Art, Media and Design at the London Metropolitan University (UK). Between 2005 and 2006 he was researcher at the Athens School of Fine Arts, Greece. Lectures at Columbia University, New York, Hochschule für Gestaltung und Kunst, FHNW, Basel, Aristotle University/ University of Western Macedonia, Thessaloniki (IPP Museology) and Istanbul Bilgi University. Curatorial work includes "Roaming Images" (2011), an exhibition on image in contemporary Arab culture, "Paint-id" (2009), an exhibition on contemporay painting in Greece, "Women Only" (2008), the first exhibition on post-feminism in Greece, "Open Plan 2007," the first international curatorial project of the Athens Art fair and the exhibition "An Outing" (2006), the first major exhibition on Greek art in the 21st century. He writes essays accompanying group and solo exhibitions and contributes to art and theory magazines (e-flux, afterimage, etc.) He is a member of the IKT (International Association of Curators of Contemporary Art) and AICA (International Art Critics Association). Maria Lazaridou is a Dramaturgy and Performance Theory graduate of the Drama Department at AUTh and a scholar of the Greek State Scholarships Foundation. She is one of the founding members of the lighting design group Βeforelight (www.beforelight.com), a creative group which has been formed to experiment with light. Searching for new ways to deliver the dynamic experience of light, the group deals with art installations and urban happenings. Its last project “Urban Lightscapes” is a multidisciplinary European project, supported by the European Cultural Foundation and whose aim is to explore and experiment on urban lighting. Maria has also been involved in the design and the coordination of educational and theatre-play workshops for children at the Teloglion Foundation of Art, the Folklife and Ethnological Museum of Macedonia-Thrace and the Archaeological Museum of Thessaloniki. In the theatre field, she has worked as dramatologist-assistant director and as lighting designer (Piramatiki Skini, National Theatre of Northern Greece, Porta Theatre, Athens and Epidaurus Festival). Political Economist, with a special interest in Economics of European Union and International Policy. 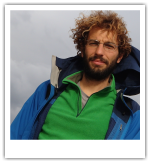 Dr. Stergios Seretis holds a PhD in Political Economy of Development and International Trade. 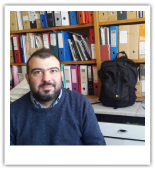 He is a post-doctoral researcher in Economic Geography at the University of the Aegean and Senior Researcher in Political Economy of Health at the Department of Medicine - Aristotle University of Thessaloniki. 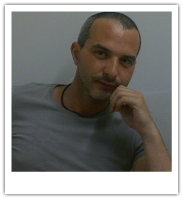 He is also Adjunct Lecturer at the Aristotle University of Thessaloniki and a Project Manager of european programmes. Christian Boltanski, Luchezar Boyadjiev, Candice Breitz, Maurizio Cattelan, Guerrilla Girls, Mona Hatoum, Damien Hirst, IRWIN, Joseph Kosuth, Ivan Mudov, Nikos Navridis, Christodoulos Panayiotou, Michelangelo Pistoletto, Wael Shawky, Mark Titchner, Vadim Zacharov, and others. Harald Szeemann, Rosa Martinez, Viktor Misiano, Iara Boubnova, Roger Buergel, Ruth Noack, Hans Belting, Daniel Birnbaum, Henry Meyric Hughes, Marta Kuzma, and others. Our services cover all phases necessary for the creation of a contemporary art exhibition or event - from initiation to closure, from conceiving and shaping the concept, to realising it, presenting it and disseminating it. Thanks to our experience, we can adapt to developments and changes without risking the end result. Project Management. Project coordination and administration. Budget monitoring. Reporting. EU program applications. Recruiting specialists and subcontractors. Communication with artists, curators and institutions. Negotiation of art work loans. Installation and architectural design. Exhibition logistics (transportation, insurance, etc.). Overseeing and editing publications, exhibition catalogues and other printed and electronic material. Promotion and press relations. Exhibition Marketing. Workshops. Talks. Lectures.